As of the beginning of September, President Donald Trump and the Department of Homeland Security (DHS) have begun to phase out Deferred Action for Childhood Arrivals (DACA), a well-known program that provided security to immigrants who came to the United States before their 16th birthday because of their parents. The President has said that the removal of DACA immigrants (known colloquially as Dreamers) will be a low priority unless they are criminals or involved in gang activity. Trump says DACA needs to be overturned “because it is a case of executive overreach,” but his administration is attempting to minimize the pain for Dreamers. Essentially, any person who is active with DACA and has a work authorization will be allowed to stay in the United States until they expire, unless it is terminated or revoked. 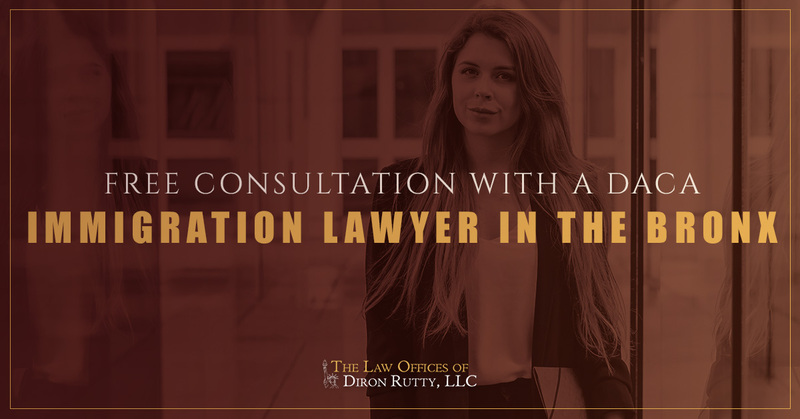 If you are a Dreamer or you know one who needs legal assistance, please connect with The Law Offices of Diron Rutty, LLC. Our team of qualified and compassionate immigration lawyers are in The Bronx and in Poughkeepsie. We offer free initial consultations to Dreamers. With the shakeup in the policy, there may be some questions about the current status of some Dreamers. This information is provided, in part, by the U.S. Citizenship and Immigration Services website. The announcement was made in the beginning of September to rescind the DACA program. Dreamers were given one month (until October 5, 2017) to submit paperwork for an initial application or to renew their status. Learn more about what may happen to Dreamers in different stages of this immigration process. Unless there is cause to terminate or revoke your current status, as a person who is currently in the DACA program, you will retain your status of deferred action and your employment authorization document (EAD) until they expire. These documents expire after two years. Both initial and renewal requests for DACA and requests for an EAD will be formally reviewed if they were received before or on September 5, 2017. In order for your renewal application to be considered by USCIS, USCIS must have received your application for a renewal request by October 5, 2017. This applies only to people who have current DACA status that expires between September 5, 2017 and March 5, 2018. Unfortunately to Dreamers who failed to meet this application deadline on September 5, 2017, the DACA process is no longer available to you. Please connect with one of our immigration lawyers to learn what possible next steps are available for you. Dreamers who currently have DACA and EAD permissions to live and to work in the United States but failed to submit a renewal request to USCIS by September 5 are, unfortunately, no longer allowed to request renewal. Please connect with our team of immigration lawyers to learn what possible next steps are available to you. Be it because your EAD was lost, stolen, or destroyed, you may still request a replacement EAD anytime during your personal validity period. This is under the presumption that the EAD is still valid. Submit Form 1-765 to request a replacement EAD. The Law Offices of Diron Rutty, LLC, specialize in immigration law. We can help Dreamers in our New York City and Poughkeepsie offices. Connect with us today to schedule a free initial consultation.